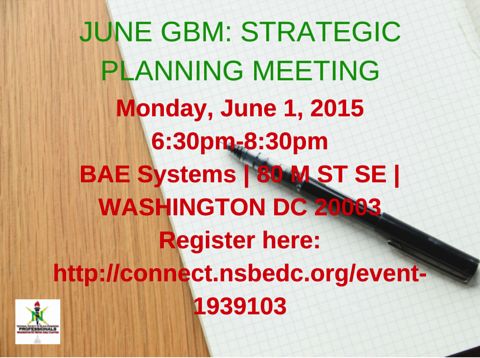 Join NSBE DC for the last General Body Meeting (GBM) for the 2015-2016 year on Monday, June 1, 2015 from 6:30pm-8:00pm at BAE Systems, 80 M St, SE, Washington DC 20003! This will be a Strategic Planning Session where we want to hear NSBE DC members actively engage in planning for next year's events for NSBE DC! Come with great ideas, best practices, lessons learned as we start planning a fantastic 2016-2017 year with NSBE DC! Food and refreshments will be provided, along with networking from 6:00pm-6:30pm! Please note, there is a Nationals baseball game scheduled at 7:05pm! NSBE DC strongly encourages you to use public transportation!